Vince Carter vs Allen Iverson Duel Highlights 2001 Playoffs ECSF G1 Raptors at 76ers ... James vs Derrick Rose Full Duel Highlights 2012.01.29 Heat vs Bulls - SICK! Vince Carter vs Allen Iverson Duel Highlights 2001 Playoffs ECSF G3 Raptors vs 76ers - VC with 50! Cavaliers Big-3 Full Highlights vs Spurs (2014.11.19) - 45 Pts 21 Reb 16 Ast Total! 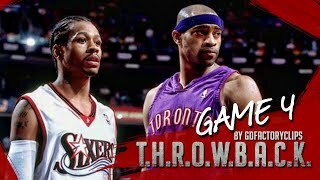 Vince Carter vs Allen Iverson Duel Highlights 2001 Playoffs ECSF G6 Raptors vs 76ers - SICK!